Phone queues are never very much fun  though, sadly, they seem to be a fairly inevitable fact of modern life. This afternoon I had to spend a certain amount of time in a phone queue and, while it was actually fairly short compared to the average in-queue waiting time, I was feeling quite tired and slightly grumpy before I started the call and even more so by the end of it (though I think I did a fairly good job of being polite to the person I finally spoke to, as I realised the queue wasn’t his fault). What made this queue especially annoying, apart from the inherent annoyance of having to wait in the first place , was the fact that while the hold-muzak was actually fairly good by hold-muzak standards (something by Tchaikovsky, I think), they kept on interrupting it with a message to say that I could also get information from their website. That would have been fine – perhaps even useful – if I’d got the phone number from somewhere else and hadn’t realised they had a website. However, I had already been on the website and it was from there that I found I could only achieve what I needed to do by phoning them up, so I wasn’t at all impressed to be invited every 30 seconds or to visit the website! I suppose it’s conceivable that some people may enjoy waiting in a phone queue; I’m certainly not one of them. At least this time I was able to do some useful stuff on my computer while I was waiting. I remember one time I made a phone call (I think it was to renew my car insurance) and ended up stuck in a queue for a very long time; fortunately one of my housemates (as I lived in a shared house at the time – this must be at least 10 years ago) had left a fairly interesting and not especially short book by the phone, and I managed to read a substantial chunk of it (my memory says about half, but it’s probably exaggerating slightly) by the time I reached the end of the queue. This is probably somewhat exaggerated but it’s certainly true that apples are quite healthy and eating them regularly is likely to have a positive rather than negative effect on your general health (sadly, I’m not sure that drinking cider counts). Actually, I read an interesting blog post fairly recently (and, sadly, have mislaid the link to it) suggesting that bananas are even healthier and we’d do better to say “A banana a day…”, but that’s digressing. This means “A healthy mind in a healthy body”. Presumably the point of this is to indicate a correlation between mental and physical health. 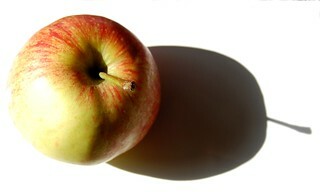 (Literally, “An apple in a healthy body”). NB in case you’re wondering about the title of this post, this Wikipedia article on macaronic language might help.